Synopsis: A young American guy (Anton Yelchin) and a young British girl (Felicity Jones) meet in college and fall in love. Their love is tested when she is required to leave the country and they must face the challenges of a long-distance relationship. Winner of the Grand Jury Prize for Best Picture at the 2011 Sundance Film Festival and of the Special Jury Prize for Best Actress for Felicity Jones, the film depicts both the hopefulness and the heartbreak of love. 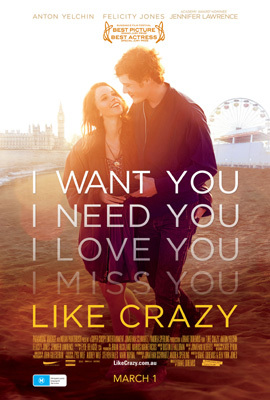 Verdict: I really, really enjoyed Like Crazy. This romantic drama has a very realistic style and grace. Like Crazy is the story of two students falling in love, whilst one is on a student VISA and is suppose to return to England once the VISA expires. Instead the young girl decides to stay in LA on an expired VISA for a couple of weeks and that's when the trouble begins.